The SF-B1203 Indoor Cycle Trainer offers all of the necessities for an amazing cardio. Effective, Durable and Comfortable are the three main advantages of Sunny Health & Fitness SF-B1203 Chain Drive Indoor Cycling Bike. 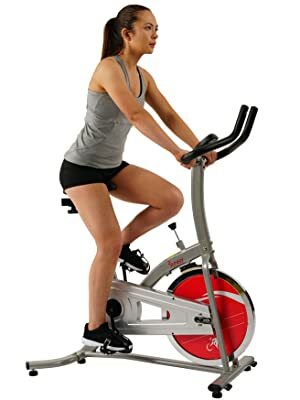 Starts pedaling towards fitness with the stationary bike that offers a smooth, quiet and lasting ride every time. Get rid of that stubborn stomach fat and start toning your core muscles and lower body. 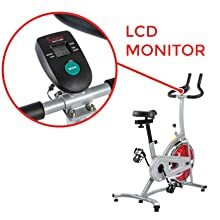 Tracking your progress on the Sunny Health and Fitness SF-B1203 Indoor Cycling Bike is simple with the Digital Monitor screen. Exercising with your cycle bike screen display will showcase the distance and time to keep you focused to achieving any type of personal fitness goals. With a convenient scan mode, you can choose to have these features continuously repeated to keep up with all calculations. The heavier the flywheel, the smoother the ride. Engineered for speed and stability this flywheel will create more momentum for longer periods of time keeping your workout going the distance. 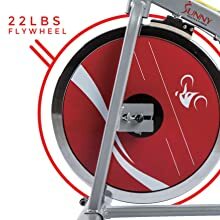 Sunny Health and Fitness’s Flywheel is second to none when it comes to feeling like you are really riding outdoors.No more jerky, out of control movements, regardless of speed or resistance level. 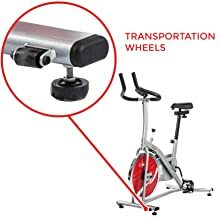 Making the transformation of your home into your own personal fitness studio is effortless with these convenient transport wheels. Simply tilt and roll out for use or away for storage. No need for heavy lifting or muscle strain. The wheels at the front of the unit allow the user to move their bike around with ease, from room to room, or store it away out of sight. 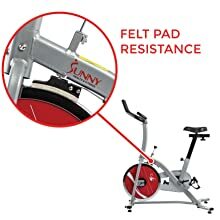 Your Sunny Health and Fitness SF-B1203 Indoor Cycling Bike is equipped with a smooth felt fabric brake pad system which allow for various tension levels providing an intense workout thus burning more calories, resulting in a toned and better you. Casual fitness enthusiasts will then be able to work out twice as hard resulting in a shorter but more intense workout.